Another glorious day here, can't believe it's February, more like May! We were out for a walk this morning and saw these two with their dog across the farm field and rather liked the effect. I like the people. Gives a sense of scale. Very nice, Judith. Love how the trees frame the walkers. 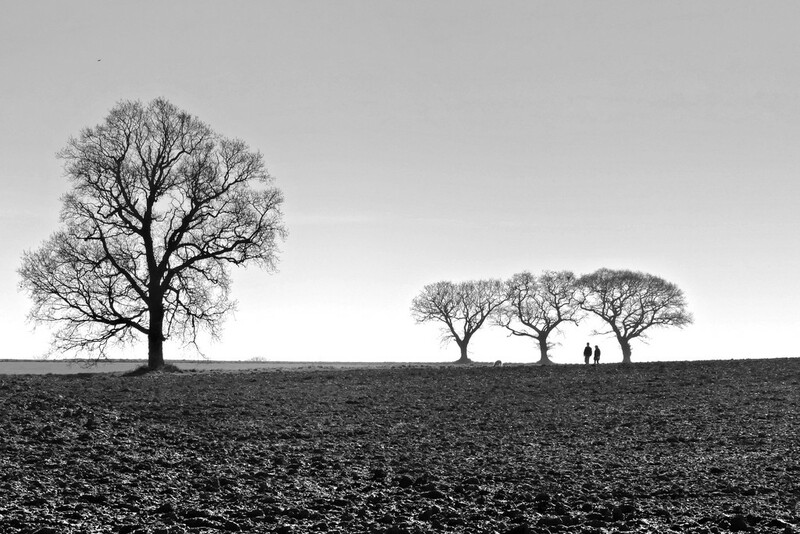 Nice!1, 2, 3 like the groupings, and lovely in b and w.
Stunning capture and a wonderful scene. Nice shot. Really love those trees. I like the effect too! this is a lovely composition. this is lovely. As it came up on my screen, the foreground was momentarily the same colour as the sky and it was stunning! It is still lovely as is but might be worth trying to lighten the foreground? @pusspup thanks for your comment. I shall have a play around! Love this...I would love this without the people and the dog. Great balance and love the b&w edit.The people and dog add another dimension. Nicely seen and processed! A fabulous capture - I love the simplicity and the B&W is perfect. Love this. It's really cool. The trees are great. Woooo, was my reaction when I first saw this picture. Keep up the great work. Really nice image. Love the composition. @tonygig thank you, thrilled to bits! @fbailey Thank you, I'm so thrilled.